Often, senior citizens are challenged by everyday activities once considered normal, such as seeing and hearing, because of a disability, illness, or medical condition like arthritis. Health aids for seniors can help you complete daily tasks that have become difficult; for example, if you can't hear, you probably have a hearing aid, and if you are having trouble walking, a walker might be your new best friend. For seniors struggling to move as easily as they once did, mobility aids provide much-needed support. 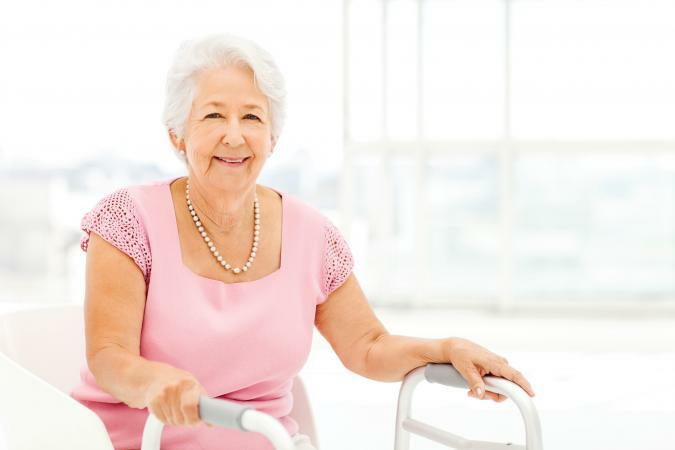 For seniors who experience difficulty walking, there are mobility aids to help them. A cane or crutches may be sufficient for those that need only need minor assistance. Others may need the help of a walker, rollator, or safety roller to be able to walk. Walkers and rollators are also available with seats for resting and baskets to aid in shopping. 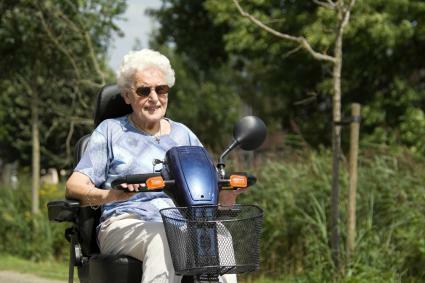 Seniors that are unable to walk, or can only walk a few steps, can still be mobile by using a manual or electric wheelchair or electric scooter. These types of mobility aids have many available accessories including baskets, oxygen carriers, and headlights. For ease in using wheelchairs and scooters around the house, ramps can be installed over entryways, small groups of stairs and uneven door jams. There are also special ramps, lifts, and electric lifts used to load power chairs, wheelchairs, and scooters into motor vehicles. Taking a bath or shower can be a challenging and sometimes dangerous task for many seniors. If you or a loved one have difficulty stepping over a bathtub wall, a transfer bench may be helpful. There are also many styles of shower chairs and benches for bathing comfort and safety. Seniors that live in a two-story house may struggle to climb the stairs to their upper level. They often become resolved to living on the ground floor because the stairs are impossible to ascend. For seniors in this situation, electric chair lifts can be installed to carry them safely to the second floor. Chair lifts are also used in some senior apartment buildings so access to the upstairs apartments is easy and safe for the tenants. Many seniors that suffer from arthritis or other health problems with limited mobility have great difficulty standing up after sitting in a chair. Power lift chairs offer much-needed help by elevating the chair seat to a certain angle which enables an individual to stand with secure footing and less strain. There are many chair styles available, including massaging lift chairs. Health aids for seniors that help people see and hear better include more than the traditional hearing aids and glasses. There are special headsets and hearing aids to make it easier to hear movies, music, and television programs. Telephone amplifiers and door knockers with flashing lights also help those with hearing loss. Seniors that are vision-impaired can choose to use large button telephones, talking watches, or reading magnifiers. Utensils, such as an offset knife can be found on Amazon.com. 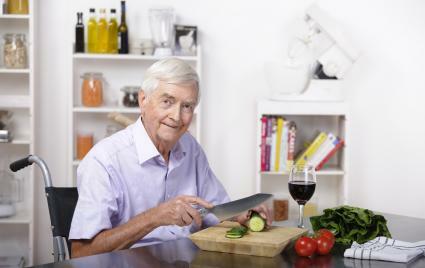 Peelers and measuring cups are also available with large, easy-grip handles to make food preparation simpler for seniors with arthritis. Eating utensils are available with curved, weighted, or bendable handles making them easier to use. Other kitchen aids include adaptive doorknobs and levers, long-handled reachers, and jar and lid openers. Most of these items can be found at IndependentLiving.com. Kitchen aids can be found at IndependentLiving.com. They carry a wide variety of kitchen aids that can help with everyday tasks such as a slicing guide, food chopper, jar top remover, color-coded measuring cups and spoons, flame-retardant oven mitts and jumbo timers, just to name a few. Mobility products can be found at ElderStore.com. They carry specialty canes, quad canes, walkers, scooters, wheelchairs, transport chairs, rollators and a lift chair. They also carry many accessories to go with these mobility aids such as bags, baskets, cup holders, safety alarms and lights, just to name a few. Bathroom items can be found at IndependentLiving.com. If everyday tasks have become more difficult due to a health condition or age, they have various bathroom aids that can help, which include shower seats and chairs, safety grip handles and rails, elevated toilet seats, commodes and more. Staircase chairlifts can be found at 101Mobility.com. 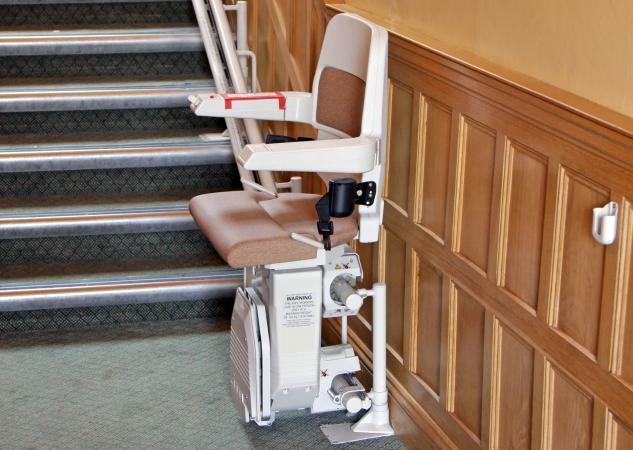 A staircase chair lift can give you easy and safe access to your multi-level home. They offer indoor straight chair lifts, outdoor chair lifts, custom curved chair lifts and stair climbers that you use with your own wheelchair. Power lift chairs can be found at PerfectSleepChair.com. A lift chair can be especially helpful if you live alone or need assistance getting out of a chair. They have different lift chair options to choose from. The two-position lift chair is to recline or sit. The three-position lift chair is to sit, recline and recline back a bit further. The infinity position lift chair allows for the most flexibility on how much you would like to recline your chair. Hearing and vision aids can be found at ElderStore.com. They have various hearing devices such as voice and ringer amplifiers, personal listening device and a super loud phone ringer. They also carry products for low vision seniors including a needle threader, specialized dinnerware and large number/voice dialer phones. Seniors can enjoy an independent lifestyle longer and more safely with a wide variety of health aids on the market today. If you or a loved one needs additional assistance, try some of these products to see what a difference they might make in day-to-day living.